This lastest report from ArtTactic reviews the global contemporary market from January to December 2012 and provides an Outlook for the global contemporary art market in the next 6 months. LONDON: Last year was one of the best years for London’s Post-war & Contemporary art market, with all sales seasons (February, June and October) experiencing an increase from 2011. Upcoming evening sales in London in February 2013 carry a low-estimate of just over £130 million, which is above the £124 million total achieved in February 2012. London’s Post-war and Contemporary art market is likely to gain market share and importance in 2013, as London is increasingly becoming a hub for Asian, Middle-Eastern and Russian collectors. NEW YORK: The record results in New York in November 2012 confirmed the strong confidence at the very top-end of the Post-war & Contemporary art market. This trend is likely to continue in 2013, but the battle between the auction houses for rare and high-quality consignments will intensify. CHINA: The next 12 months will be crucial for the sales of Chinese contemporary art as this will tell us more about how boom-time buyers and investors are coming to terms with a slowing market. Despite the sharp slowdown, a recent poll among international art collectors suggests that 43% expect the market to rebound in 2013. INDIA: It looks like June 2012 marked a low point in the Indian art market and that 2013 is likely to see improving market conditions. The 5th edition of India Art Fair together with the new Kochi-Muziris Biennale launched in December 2012 have injected new energy in the Indian art market. MIDDLE EAST: Despite the negative auction trend in recent years, 52% of international collectors polled by ArtTactic in January 2013 said they believe the market will go up in the next six months, versus 5% who think it may fall further. With Christie’s and Sotheby’s continued commitment to the region, and art fairs such as Art Dubai and Art Abu Dhabi supporting the primary market, we could start to see confidence creeping back into this market in 2013. LATIN-AMERICA: Looking ahead, this is the region that most collectors expect to do well in 2013, with 59% of respondents believing that this market will go up in the next six months. Higher sales and prices are likely to encourage HNWIs in the region to start turning to art, not only as a collectible, but also as an asset class. 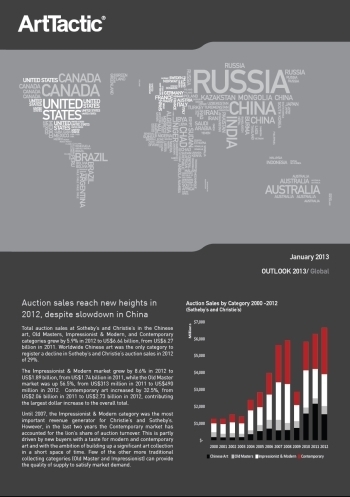 RUSSIA: The positive auction sales trend is likely to continue in 2013, with 29% of the collectors surveyed by ArtTactic in January 2013 believing the market will go up in the first half of 2013.